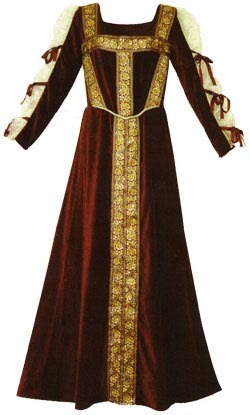 This elegant gown is created in the style of Eleanora of Toledo's Gown from Janet Arnold's Patterns of Fashion. The rich burgundy cotton velvet body gives a form-fitted appearance and is exquisitely accented with a hand-beaded gold trim. The sleeves have a sheer soft netting and are finished with matching burgundy bows. Dry Clean Only. Choose adult women's size Small, Medium, Large, or Extra Large. Small 28" - 30" 32" - 34"
Medium 32" - 34" 34" - 36"
Large 34" - 36" 36" - 38"
X-Large 36" - 38" 38" - 40"